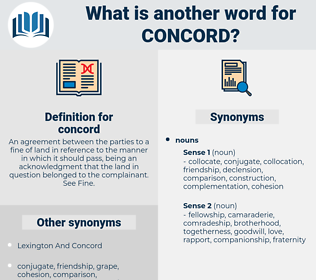 What is another word for concord? An agreement between the parties to a fine of land in reference to the manner in which it should pass, being an acknowledgment that the land in question belonged to the complainant. See Fine. disunity, agitation, disharmony, disagreement, discord. disunion, separation, inconsistency, opposition, scission, variance, difference, turmoil, hatred, antipathy, incongruity, estrangement, warfare, disproportion, breach, severance, hostility, rupture, battle, divorce, contest, alienation, disorder, antagonism, disturbance, unfriendliness, anarchy. The mere knowledge of the Word cannot protect us, if every one is allowed to interpret it as he pleases, if the spirit of concord, the Holy Spirit does not dwell in them, who use it. mass., bay state, old colony, ma, massachusetts. gender agreement, person agreement, case agreement, number agreement.